This example shows how to create and manage options for the genetic algorithm function ga using optimoptions in the Global Optimization Toolbox. ga searches for a minimum of a function using the genetic algorithm. For this example we will use ga to minimize the fitness function shufcn. shufcn is a real valued function of two variables. We can use the function plotobjective in the toolbox to plot the function shufcn over the range = [-2 2;-2 2]. To use the ga solver, we need to provide at least two input arguments, a fitness function and the number of variables in the problem. The first two output arguments returned by ga are x, the best point found, and Fval, the function value at the best point. A third output argument, exitFlag tells you the reason why ga stopped. ga can also return a fourth argument, Output, which contains information about the performance of the solver. Optimization terminated: average change in the fitness value less than options.FunctionTolerance. If you run this example without the rng default command, your result can differ. This behavior is explained later in this example. The Genetic Algorithm works on a population using a set of operators that are applied to the population. A population is a set of points in the design space. The initial population is generated randomly by default. The next generation of the population is computed using the fitness of the individuals in the current generation. ga can accept one or more plot functions through an options argument. This feature is useful for visualizing the performance of the solver at run time. 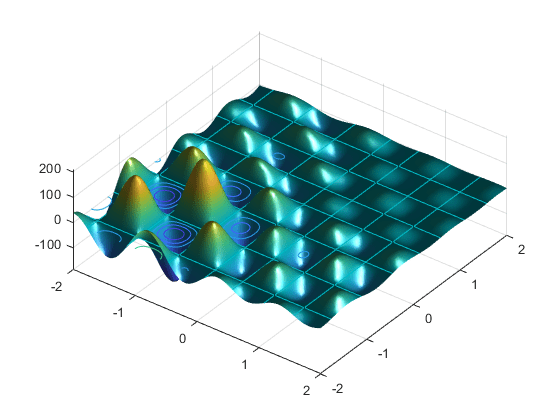 Plot functions can be selected using optimoptions. Here we use optimoptions to select two plot functions. 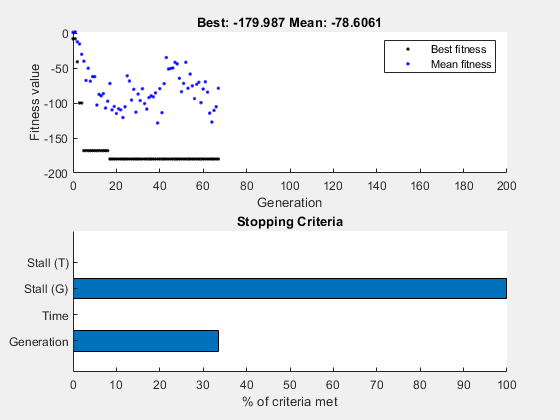 The first plot function is gaplotbestf, which plots the best and mean score of the population at every generation. 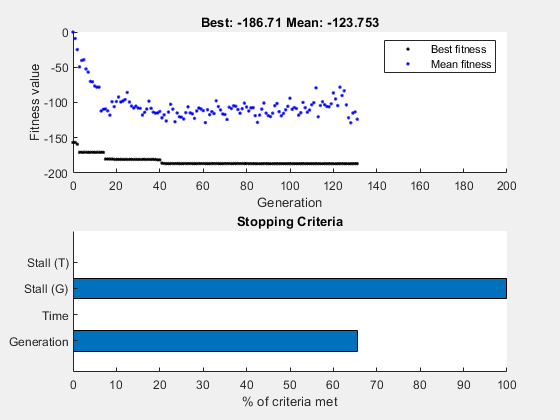 The second plot function is gaplotstopping, which plots the percentage of stopping criteria satisfied. The default initial population is created using a uniform random number generator. Default values for the population size and the range of the initial population are used to create the initial population. The default population size used by ga is 50 when the number of decision variables is less than 5 and 200 otherwise. This size can be a poor one for some problems; a smaller population size can be sufficient for smaller problems. Since we only have two variables, we specify a population size of 10. We directly set the value of the option PopulationSize to 10 in our previously created options, opts. The initial range can be set by changing the InitialPopulationRange option. The range must be a matrix with two rows. If the range has only one column, i.e., it is 2-by-1, then the range of every variable is the given range. For example, if we set the range to [-1; 1], then the initial range for both our variables is -1 to 1. To specify a different initial range for each variable, the range must be specified as a matrix with two rows and numberOfVariables columns. For example if we set the range to [-1 0; 1 2], then the first variable will be in the range -1 to 1, and the second variable will be in the range 0 to 2 (so each column corresponds to a variable). We will directly modify the value of the option InitialPopulationRange in our previously created options, opts. By default, ga starts with a random initial population which is created using MATLAB® random number generators. The next generation is produced using ga operators that also use these same random number generators. Every time a random number is generated, the state of the random number generators change. This means that even if you do not change any options, when you run again you can get different results. Here we run the solver twice to show this phenomenon. In the previous two runs, ga gave different results. The results are different because the states of the random number generators have changed from one run to another. If you know that you want to reproduce your results before you run ga, you can save the state of the random number stream. Reset the stream and rerun ga. The results are identical to the previous run. However, you might not have realized that you would want to try to reproduce the results before running ga. In that case, as long as you have the output structure, you can reset the random number generator as follows. Rerun ga. Again, the results are identical. ga uses four different criteria to determine when to stop the solver. 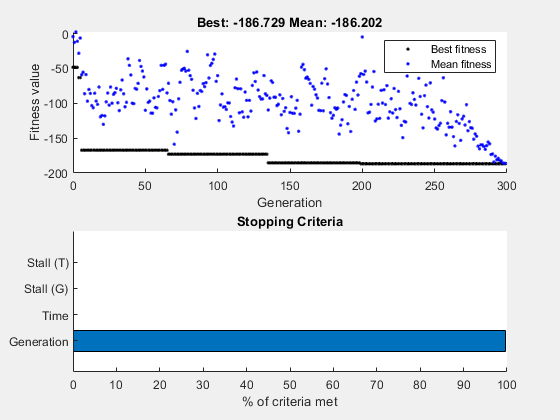 ga stops when the maximum number of generations is reached; by default this number is 100. ga also detects if there is no change in the best fitness value for some time given in seconds (stall time limit), or for some number of generations (maximum stall generations). Another criteria is the maximum time limit in seconds. Here we modify the stopping criteria to increase the maximum number of generations to 150 and the maximum stall generations to 100. Run the ga solver again. ga starts with a random set of points in the population and uses operators to produce the next generation of the population. The different operators are scaling, selection, crossover, and mutation. The toolbox provides several functions to choose from for each operator. Here we choose fitscalingprop for FitnessScalingFcn and selectiontournament for SelectionFcn. The best function value can improve or it can get worse by choosing different operators. Choosing a good set of operators for your problem is often best done by experimentation.